Log trucks waiting to cross Laos-Vietnam border with illicit wood, January 2008. Source: EIA – Environmental Crime (pg 9). Commercial poaching describes a vast array of illegal activities related to illegally killing or capturing wildlife or sea life. People who make a career (page 20) of illegally hunting wildlife and selling the bushmeat or trophies from the animals are the most common example of commercial poachers. Wildlife trophies and animal parts such as skins, claws, teeth, quills, and other items suitable as souvenirs are sold to tourists who are usually unaware of the origin of the items. There are also commercial poachers who are involved in the illegal wildlife trade and capture rare or highly prized wildlife and sell the live fish or animals to interested buyers to keep as exotic pets or are sold to private zoos. 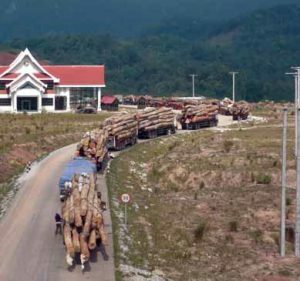 Hardwood trees are also targeted by poachers who sell the wood to locals who make souvenirs for tourists or sell large pieces of lumber to wood manufacturing companies. Commercial poaching through the acts of over-fishing and illegal fishing also occurs in the world’s oceans and many of its seas, including the Mediterranean, and threatens the sustainability of sea life that are popular seafood. 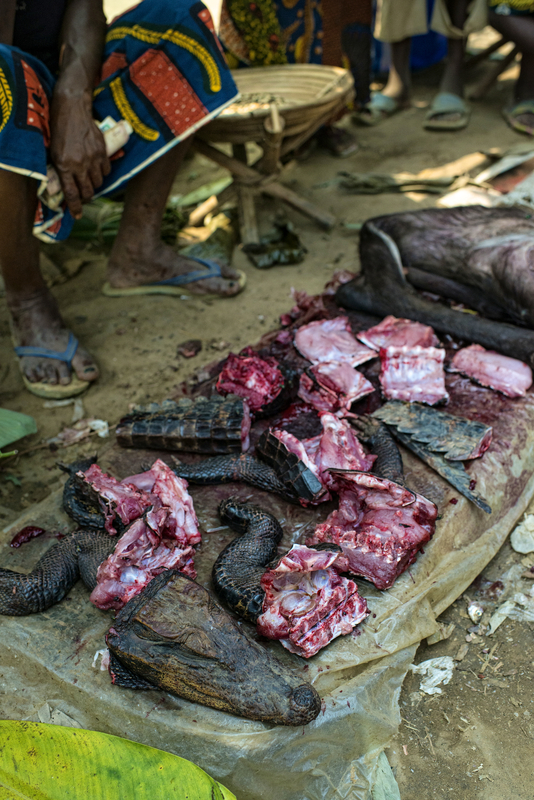 Crocodile and antelope meat at Mountuka Nunene market in Lukolela, DRC. Photo by Ollivier Girard for CIFOR. Local bushmeat poaching poses a serious health risk (page 124) to people that buy contaminated meat or those that come into contact with diseased animals. Unlike meat they might find at a market the bushmeat procured cheaply and illegitimately from commercial poachers may be taken from the rotten carcasses of animals that have been snared and left to die in the sun. Drying and smoking bushmeat is a common practice for preserving food, even meat taken from rotting carcasses. But rotten meat may still have the ability to spread food-borne illnesses and some types of diseases. Bushmeat poachers that routinely hunt do so for business purposes, but in West Africa studies have shown that commercial poachers typically spend their incomes on non-essential items (page 128) instead of re-investing the money as a legitimate business would. Some poachers cater to specific interest, particularly in regions where certain parts from common wildlife species are thought to have supernatural powers, such as the brains of a vulture. These birds are then illegally killed en masse and the parts sold to people who practice folk medicine. This practice has intensified the decline in Old World vulture populations and other species that depend on them to keep the environment clean. The methods used to poach small game in Asia and Africa pose threats to other wildlife as well. Metal snares indiscriminately target any wildlife that gets caught in the metal noose, even elephants. These inexpensive traps are frequently set up by the dozen and the poacher can check the snares at their leisure. Forgotten metal snares do not biodegrade after weeks and years of poor weather and will still trap, maim, and kill wildlife. In regions without enough scavengers the corpses of snared animals will decay, sometimes creating anthrax, and can poison water sources that non-predatory animals depend on for nourishment. Livestock medicine (diclofenac), cyanide, and agricultural pesticides have purposefully or accidentally resulted in the indiscriminate deaths of large and small species. 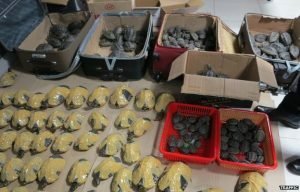 Seized Turtles. Photo by TRAFFIC. Illegal fishing has a dramatic long-term economic and environmental impacts as well (page 578). Fishing without a license and businesses engaged in over-fishing by exceeding their quota exploit local resources and can exceed the sustainability of wild fish populations. Deep sea fishing is often restricted to internationally agreed upon exclusive economic zones or a nation’s territorial waters (page 1), but poachers illegally fish outside of their registered area or over-fish in their own territory. This creates a dramatic decrease in future yields over the long term (page 580) and impacts the economic viability of deep-water fishing as a business. Exotic fish and turtles are also targeted by commercial poachers who then sell the fish to legitimate pet fish stores and street vendors. All of these fishing practices detract from legal, regulated businesses and can result in consumers potentially purchasing unsafe and illegally acquired products. In some instances commercial poachers are at the bottom level of large-scale poaching syndicates and do the ground work which international criminal organizations profit from (page 14). Career poachers cull local wildlife or sea-life populations and deprive legitimate businesses of their sources of revenue and local villages of traditional sources of food as well as killing off exotic wildlife such as India’s tigers. This takes away the opportunities of small villages and towns to provide for themselves and can force destitute individuals to hunt larger, more dangerous wildlife or to subsist on meat from wildlife that died of disease. The species hunted for bushmeat varies by region, but typically small- and medium-sized game up to 250 kilograms (550 pounds) are targeted. In Liberia and the Congo Basin larger wildlife like elephants and pygmy hippopotamuses are sometimes illegally killed for legitimate food needs by local villagers and other times killed for their bushmeat by poachers. Large seizure of big cat skins in Khaga, India in 2000. Source: EIA Tiger Skin Trail (pg 6). The big cat skin trade is thriving in Asia in large part due to burgeoning commercial poaching operations in India and neighboring countries. For many decades India has had weak penalties and lax enforcement of poaching laws, even for repeat offenders, which has resulting in expansive commercial poaching and brazen acts of trafficking. In October of 2003 a shipment of skins from 581 leopards, 31 tigers, and 778 otters (pages 1, 5) was intercepted at the India-Tibet border. 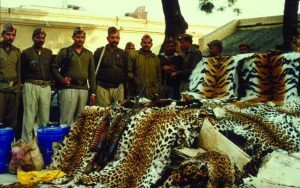 An incident in July of 2004 in Kanpur, India saw the seizure of 456 leopard and tiger claws and $13,000 in cash (page 5). Giraffe poachers arrested by Big Life Rangers in Rombo, Kenya. May 2011. Photo by Big Life. Bushmeat poaching in protected areas occurs at a staggering volume in Kenya. 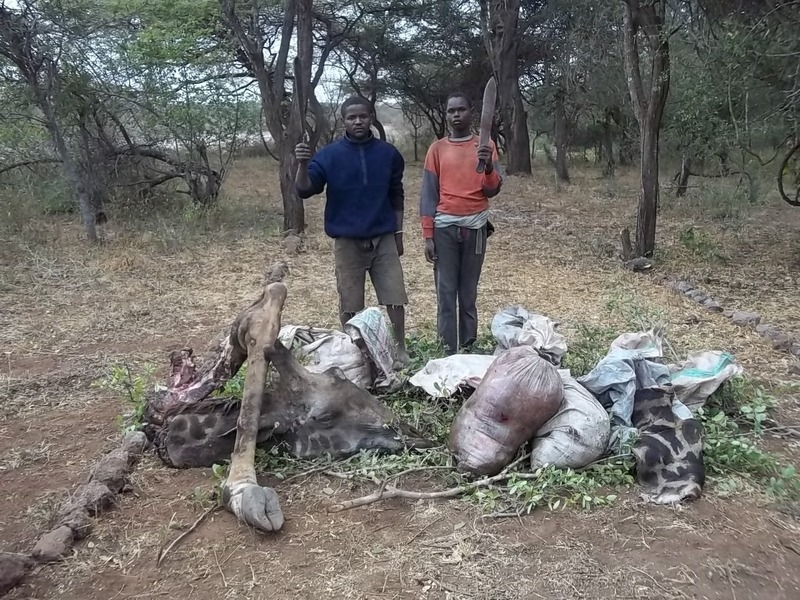 During 2007 more than 239 arrests were made and 15,300 kilograms (over 33,700 pounds) of bushmeat were recovered by Kenya Wildlife Service employees from failed poaching attempts, seizures made during arrests, or discovered snared animals. In 2008 there were 334 arrests related to bushmeat poaching (pages 28, 29) and over 7,000 kg recovered, with a similar number of arrests and recoveries in 2010. Data on bushmeat poaching arrests is not provided from 2011-present, however in 2012 more than 6,700 kilograms were recovered and in 2013 that number rose to more than 10,000 kg. In 2011 rangers employed by Big Life arrested and prosecuted 627 poachers. In September of 2014 the rangers arrested 37 individuals in 18 different bushmeat poaching incidents.